BANGKOK, May 4, 2015 — Within hours of the April 25, 2015 earthquake that killed and injured thousands of people and devastated much of Kathmandu’s tourism infrastructure, the PATA Foundation has made a commitment to assist the PATA Nepal Chapter in its tourism industry recovery efforts. 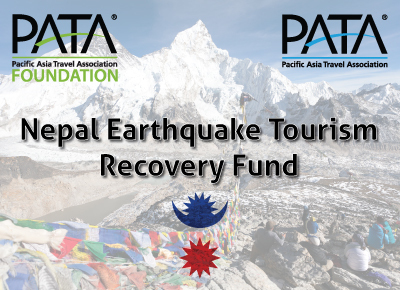 The PATA Foundation has established a Nepal Earthquake Tourism Recovery Fund to which the Foundation has contributed an initial amount of US$10,000. Admittedly, the available PATA Foundation funds represent only a small contribution to what is certain to be an extraordinary need in terms of money and technical assistance. Therefore, the PATA Foundation welcomes individuals and organisations to contribute additional money to this fund by making donations through the following link: http://www.patafoundation.org/?page_id=147. Mr. Peter Semone, Chairman of PATA Foundation Board of Trustees, publicly pledged the Foundation’s assistance at the PATA Foundation Charity Gala Dinner on April 25th in Leshan, Sichuan, China. Over 300 delegates in attendance from over 30 countries expressed their condolences and wished for a speedy recovery as Nepal works to overcome this current state of crisis. The PATA Foundation is awaiting further details on to how it intends to mobilise PATA Foundation money in the coming weeks and months, once the immediate humanitarian crisis response efforts have been completed.